Set within the compound of The Emerald are many recreational and sporting facilities exclusively catered to the residents at The Emerald. Over the last 10 years, The Emerald has seen mature transformation in estate planning and management. Better understanding of the recreational needs of the various resident profiles, more facilities and services are added in the project development, whilst maintaining its uniquely spacious garden villa concept. Today, there are two clubhouse buildings with combined area of 7,000sm and 3 swimming pools, where your leisure activities will be enriched. 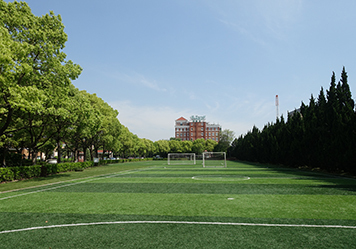 For the sports enthusiast executives, one can find many options to flex the muscles -- 4 tennis courts with professional coach, a Sports Hall with basket ball and badminton courts, a soccer field that finds many residents enjoying a game of football on weekends. The indoor swimming pool (25mx 12m) at the Clubhouse caters to the keen swimmers throughout the year while the two outdoor swimming pools offers plenty of leisure activities, lounging space to beat the summer heat amidst the tropical garden setting and waterscape. There is also a putting green by the Clubhouse. During the cold winter, against the clear blue sky and those familiar chimneys over the grey-tiled pitched roof, kids are seen playing snow balls and snowman in the field of white snow in The Emerald, these are beautiful moments and give such a nostalgic country home feel. A rare spot in Shanghai only at The Emerald, one that comes with a very privileged lifestyle indeed. The attention to every detail and exceptional service include the very mundane stuff, The Emerald provides a mini-market for groceries, western restaurant (MJ resto ) and regular shuttle bus services to Puxi downtown, pick-up services to the various international schools in Shanghai. Our Thursday morning Fresh Market comes complete with fresh flowers, special imported salami, home made pickles and spices for the western kitchen. The Emerald assures you a peaceful and serene lifestyle, one carefree of concern. The Club House, decorated in warm tropical colors, and special water features, the club house architecture exemplifies Balinese warmth to keep at bay the cold, wet Shanghai winters. Built around a two storey sky-lit hall, the first floor of the facility is home to cafeteria with special dining and VIP rooms featuring fine cuisine from home and abroad. The sub-tropical garden is enclosed by the club facility itself. The club house contains outdoor facilities - soccer field, four tennis courts and indoor basket court and a gymnasium. The full sized 25 meter temperature-controlled swimming pool, solarium, saunas and children' s play grounds provide healthy alternatives for the entire family. Club House II situated in the newest phase of The Emerald, its resort style pool with romantic lightings, jacuzzi, indoor children playground and cafeteria is a haven and home for the members of exclusive community of The Emerald. The Grand ballroom and elegant dining hall located inside Clubhouse II will cater to your every imagination of parties and events. This function hall has been a place of numerous events, from business to family parties including our annual Welcome Party in the fall, a gala event where residents wound mingle among friends and neighbors, let their hair down in an evening of music and dance. Emerald Function Hall, architectural excellence houses a grand ballroom and elegant dining facilities, the dynamic 2-storey Emerald Multi-Function Hall makes for any event, from meetings with to exhibitions to parties, a remarkable experience. The Emerald may provide services for your soiree which include catering, business center facilities, modern video and audio systems and optional events-organising to assure the smooth realization of your function. The multi-function hall extends onto a barbecue patio featuring a waterfall and an outdoor swimming pool, creating yet another delightful dimension to your guest's experience. British International School Shanghai Established in 2002, The British International School Shanghai, Pudong campus has a proven track record of achievement both inside and beyond the classroom. As members of Nord Anglia Education, and with students from 60 countries, we offer a truly international education. Learning is based on the British National Curriculum and we offer the IGCSE and International Baccalaureate courses and examinations. We offer first-class facilities, including a 400-seat auditorium, 25m indoor swimming pool, three gymnasiums, tennis courts, a full-size football field and other multi-purpose outdoor areas. Our campus is structured around six school phases; Early Years (18mths-5yrs), Infants (6–7yrs), Junior School (8–10yrs), Middle School (11-13yrs), Upper School (14-16yrs) and Senior School (17-18yrs). These deliberately small school phases provide students with a nurturing and supportive environment focused on their individual needs. Nord Anglia’s Global Classroom is an online portal that allows our students to connect with students from 28 other schools around the world, learning and debating, and building their understanding of different cultures. Our students achieve consistently excellent exam results, ensuring places in the world’s top universities. Highly skilled and dedicated teachers are key to our success. All of our teachers hold UK recognised teaching qualifications and receive regular professional development. Many have years of teaching and leadership experience in both British and international schools, bringing a wealth of experience to their roles. Our teachers are part of the BISS Pudong family, with average tenure over five years. SCIS - Emerald International School, the sphere of education came to life in an unparalleled achievement, the opening within the compound exceptional Pre-school facilities to creative and scientific curriculums designed for grades as high as the Upper School of the SC International School. The distinguished awards received by the SCIS educational group are reflected in the comprehensive and innovative strengths of the SC International School, which is housed at The Emerald. With easy access to many compounds in both the Pudong and Puxi areas, Wellington College International Shanghai is a co-educational day and boarding school with over 600 pupils, aged 2 to 18. Partner with the prestigious Wellington College in the UK, Wellington in Shanghai offers a curriculum that is the National Curriculum for England and Wales supported by International Primary Curriculum in the lower grades. Pupils study IGCSE from the age of 14 and then progress onto the IB Diploma in their final 2 years at College. Driven by its unique educational ethos - the Wellington Aptitudes and the Wellington Values, Wellington’s curriculum is designed so that all pupils become well-rounded adults, equipped with the skills, knowledge, attitudes and values essential to meet the challenges of society in the 21st century. Wellington College in Shanghai has built a vibrant community where pupils strive to reach academic excellence and engage in a wide range of opportunities in music, performing arts, service and sports within the Co-curricular and Academy Programmes. Wellington aims to provide pupils with a comprehensive and well-equipped learning environment, which includes hundreds of spacious classrooms, outstanding art and music facilities, professional standard theatre seating 500, competition standard indoor swimming pool and training pool, excellent indoor sports areas including squash courts and gym, 400m athletics track, outstanding pitches for football, rugby and cricket and tennis courts. Harrow International School Shanghai will be a day and boarding school for students aged 2-18. Pre-Nursery to Year 8 will open in August 2016 on the newly developed Sunland project in the Waigaoqiao Free Trade Zone, 30 minutes from the centre of Shanghai. From August 2017, the School will offer Year 11 and 12 (Year 13 which will commence in August 2018). Boarding is integral to the life of the School and is expected to be available at Harrow Shanghai in late 2017. Harrow International School Shanghai will be the fourth international school in the growing family of schools which currently includes Harrow School and The John Lyon School both in London, and the Harrow International Schools in Bangkok (opened 1998), Beijing (opened 2005) and Hong Kong (opened 2012). At Harrow International School Shanghai, as with its namesake, Harrow School, and the other Harrow International Schools, students will be expected to be fully involved and achieve their best in academic studies, extra-curricular activities and House events. The House is central to the life of students at Harrow School and also for students in the Harrow International Schools. Students will have the choice to enter boarding from Year 6 and all Year 9-13 students, including day students, will be based in the boarding Houses. The curriculum of the School will be based upon the National Curriculum of England culminating in IGCSEs and A-levels but the emphasis will be on an all-round education. Located at the Sunland Project in the Waigaoqiao Free Trade Zone in Pudong, the School is only 30 minutes from the centre of Shanghai by ring road and 35 minutes from the Kangqiao Area.